We are living in a VUCA world. Volatility, uncertainty, complexity and ambiguity in the current business climate call for new leadership models and new rules of engagement to navigate the age of artificial intelligence successfully. We need innovators. We need originators. We need early adopters. We need agile learners. But we also need heart-focused leaders to prime organisations for success in tomorrow’s world. management that often results in high levels of disengagement and attrition, and embraces instead positive organisational science to optimise the performance of its workforce. We need to create positive workplaces built on trust, collaboration, growth, support and wellbeing, as these hallmarks of positive psychology have been statistically proven to improve innovation, engagement, productivity, and profitability. The demands of life are changing every day. The mindsets and behaviours that carried you through yesterday will not be enough to guarantee success tomorrow. Individuals who are nimble, open to change and embracing challenges will thrive. Positive psychology is an emerging branch of applied psychology devoted to the pursuit of optimal levels of human functioning and well- being in the context of personal, group and organisational development. 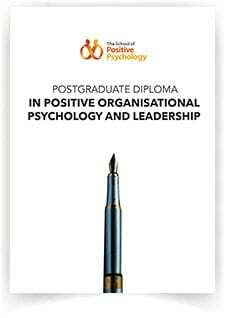 Equip yourself with the Postgraduate Diploma in Positive Organisational Psychology and Leadership and place yourself at the vanguard of the science that drives organisational excellence. Through this 12-month programme offered in affiliation with Anglia Ruskin University, you will gain a comprehensive understanding of positive organisational psychology and the various tools and strategies used to deliver high-impact interventions that enhance the psychological capital and optimise the wellbeing of your staff, team or coaching clients. You will be introduced to research and interventions around topics like positive and negative emotions, character strengths, motivation, resilience, creativity and wisdom, and learn real-life applications to promote psychological fitness and organisational wellbeing. This programme is suitable for psychology graduates, human resource professionals, corporate leaders, life coaches and trainers who will be able to use the skills acquired to influence government, business, education, and communities. We offer a wide selection of modules that allow you to tailor your learning to your career goals. With the Postgraduate Diploma in Positive Organisational Psychology and Leadership, career pathways include working as a positive psychologist in government agencies such as the Army, as well as in human resource departments, schools, research and consulting firms, healthcare facilities and hospitals, and organisations that offer counselling services. How can you optimise the effectiveness of your employees or training participants? How does an individual’s belief system affect their personal motivation and how can we trigger a change in mindset to enhance intrinsic motivation? How can we harness the collective intelligence of organisational members to encourage prosocial behaviours in the workplace? These are some of the questions and topics that will be explored in the Positive Psychology Training and Consultancy module. In this module, you will learn how to design, implement and evaluate various Positive Psychological Interventions (PPI) that can be used to elicit behavioural change, and gain a sound understanding of when to deploy a specific intervention in the context of your training and consultancy work. You will critically assess the various PPIs; their skills, techniques and strategies, as well as identify the blind spots and weaknesses of each PPI. You will also learn how to determine the effectiveness, fit and relevance of each PPI in relation to your participants’ training objectives. Learning methodology will cover both theoretical and practical tools for training around the concepts of happiness and emotions, through the use of the Hands-On-Thinking Method (HOTM) and research-based tools such as HEXTM Cards and Lego Serious Play to facilitate learning and creative collaboration. In the course of this module, the relationship between time, wellbeing and performance will be discussed and operationalised for organisational excellence vis-à-vis empirical research on the psychology of time, time perspective and subjective time use. It will further equip learners with the skills to facilitate and sustain optimal performance in your training participants by helping them achieve work-life balance or time affluence. Finally, the module will explore the interaction between our conscious and unconscious cognitive processes, including known barriers to implementing a successful change such as beliefs, mindset, low levels of self-regulation, and the complexity of the change process itself, and introduce participants to the theories and tools of attention-focusing, cognitive flexibility, and the concept of “nudge theory” in behavioural science. Do positive relationships have a measurable impact on the workplace and work output? What can leaders do to create a positive work environment built on trust and collaboration? How can we harness interpersonal and inter-organisational dynamics to help organisations vault forward? This module explores the concept of Self and the notion of Self in relation to others from an existential, developmental, psychoanalytical and social psychological standpoint. It will draw upon positive organisational science to examine the qualities needed to build positive relationships with others, and to create prosocial communities and future-oriented organisations where positive-oriented leadership, collaboration, trust, compassion and intimacy flourish. It will also shed light on the barriers to achieving these. Throughout the module, you will be encouraged to strengthen your skills in self-reflection and critical- and analytical-thinking in relation to personal, academic, and practitioner-oriented (as applied positive psychologists) levels of exploration. How do we build the psychological capital of our employees and coachees to induce optimal performance? How do we capitalise on their existing strengths and maximise their potential? How do we successfully implement a change management programme to increase intrinsic motivation and engagement in the pursuit of individual and organisational goals? This module is dedicated to optimising the performance and output of your employees or training/coaching clients through the deployment of science-based coaching methodologies and interventions. In the study of Positive Psychology Coaching, traditional assumptions of human behaviour will be challenged as we critically explore the argument for strengths- rather than a deficiency-based approach to performance improvement. This module will equip coaching practitioners with a tangible toolkit of skills to create, implement and sustain optimal performance by helping their coachees identify and harness their strengths while building upon their psychological capital. It will introduce new positive psychology-based tools and models developed specifically for coaching practice, and discuss the various contexts in which to deploy existing Positive Psychology Interventions. Learners will acquire the skills necessary to function as an effective change agent in the capacity of a manager, coach or mentor using leading-edge interventions based on the latest scientific research and discoveries. These include business-relevant skills such as strengths-development, and the application of goal theory and “hope diagnosis” to promote perseverance and develop courageous leadership skills. Upon completion of this module, students will be able to clock 32.5 coaching training hours with the International Coach Federation (ICF), the gold standard credential for the coaching profession. They will also receive a certification accrediting the number of ICF hours clocked by The School of Positive Psychology and Positive Acorn, one of the leading authorities in the area of positive psychology coaching in the world. What drives peak performance in an organisation? How do we maximise human capital and build robust teams? How do we develop creative, innovative and adaptive organisations of the future? In this module, you will learn to strategically apply the principles of positive organisational psychology to create performance-oriented teams and positive-oriented business environments conducive to human flourishing. You will study the science of organisational excellence and how it can be used to harness human potential (abilities, strengths and talent) to catapult performance from the baseline of normality to extraordinary and inspiring standards of excellence. collective intelligence to build creative, innovative, adaptive and agile organisations and future-oriented workforces. You will learn to drive organisational transformation through an infusion of positive change, underwritten by quantifiable results on motivation, engagement and productivity. This module will equip you with positive organisational psychology assessment tools and positive management techniques to create a prosocial workforce that not only prizes the virtues of human relationships such as authenticity, connection and communication, but also inspires the level of social change that could make a real positive impact in the world. In short, you will learn how to prime people and organisations for the vanguard of human excellence. World-renowned authorities on the subject of positive psychology from Europe and North America will lead the programme in Singapore through intensive week-long masterclass seminars for each of the four modules, based on a schedule designed for adult learning. Our professors will impart their leading edge expertise on positive organisational psychology including the latest research, industry experiences and evidence-based organisational leadership and coaching intervention tools. In between these face-to-face training sessions, self-directed study is recommended to build on your understanding of the concepts.